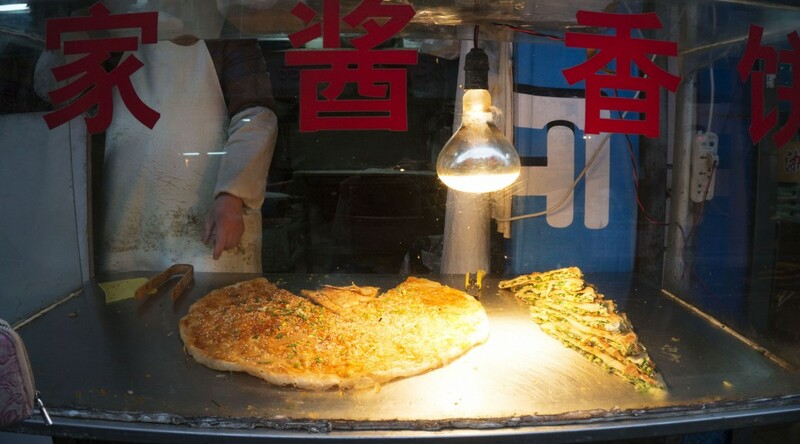 Cōng yóubǐng (Chinese: 葱油饼) is a savory, non-leavened flatbread that can be found in wet markets or on the street side in small glass-box stands. Scallions are dispersed throughout the dough, and it can be topped with various flavors including spicy and spicy sauce, plain, or with eggs coated on one side. The pancakes are served by weight, ranging in price depending on amount desired. Flour is combined with minced scallions, lard, and salt. The dough is rolled out thinly and fried in oil. It can then be left plain or topped with hoisin, sweet chili sauce, or cooked with egg. A combination of flour, salt, oil, and water are combined in order to make the dough. The pancake is formed on a floured surface after the dough is rolled out into a thin layer. It is then brushed with sesame oil, sprinkled with scallions, rolled into a coil, and flattened out again to create flaky layers. The dough is fried in a shallow pan until golden brown. For different flavors, the dough is smeared with spicy sauce, hoisin sauce, or cooked again with egg on one side. Origins of cong you bing are unclear, but a Chinese folk story that relates to the evolution of pizza and its relation to the scallion pancake which believes that Marco Polo had brought it back to Italy upon his return. A humorous newspaper article describes the invention of pizza stating that Marco Polo had missed scallion pancakes so much that he tried to find chefs willing to make it for him. After convincing a chef from Naples to recreate the dish and finding that he was unable to, Marco Polo suggested that the filling be placed on top of the dough rather than inside. Everyone at that dinner party praised the dish, and the chef returned to Naples to improvise with his creation by adding cheese and other ingredients to form today’s pizza.